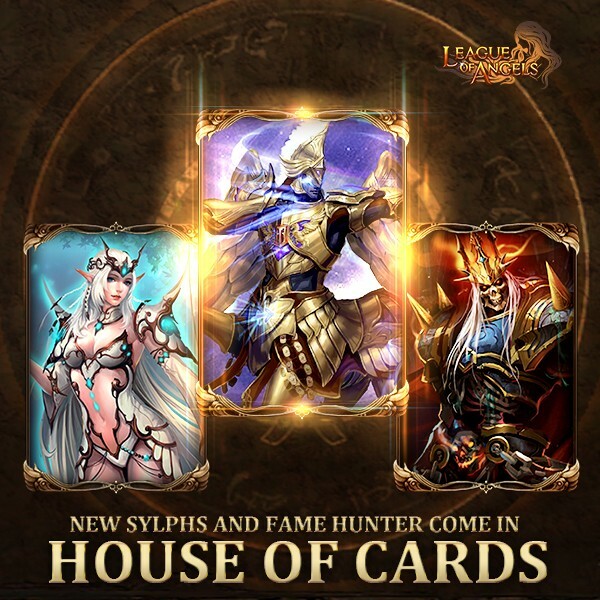 North America Forum»Forum ›League of Angels ›News and Announceme... › House of Cards: Recruit Powerful Sylph and Heroes! House of Cards: Recruit Powerful Sylph and Heroes! - You can swap the required cards for: Nether Lord (evolved from king\'s O\'bones), Fame Hunter (second evolution of Lunar Preistess), Crescent Elf (evolved from Lunar Preistess), Lunar Preistess, Leoric (new Sylph), Exiled Arrow ( new Sylph), Kongfu Panda, Panda Nicky, Valentina, Amazon Hawker, Amazon Hunter, Ghost Paladin, Yasi Delaney, Dragon Queen, Dragon Empress, Poseidon, Dark Paladin, Headless Horseman, Lvl 11 Agility+ Hit, Lvl 11 Agility+ Crit, Lvl 11 Dodge +Hit, Lvl 10 PATK+Dodge, Lvl 10 MATK+Dodge, Lvl 10 Crit+Hit, Lvl.8 Dodge+Hit Gem, Lvl.8 MATK+Dodge, Lvl.8 PATK+HP, Lvl.8 Crit+Hit Gem, Stable Crystal, Epic Flaming Stone, Blessed Stone, Elemental scroll, Magic Socketing Rod, and many more! Description: Consume certain amount to get extra rewards like King of Spades, Ace of Spades, Card Lotto Voucher, Hero\'s Mark, and Joker (S). More exciting events are coming up through Otc 6 to Oct 9 (Server Time), check them out in the in-game Hot Events menu now! Why we dont have card events ? Like Devo Bargain. Can you put in hot events something like that ? Didn\'t we like already have House of Cards a few days ago? i dont see how we get HoC vouchers for free ?add Event bonus atleast . Most important event and we dont get cards ..
2019-4-21 23:04 GMT+8 , Processed in 0.070430 second(s), 52 queries .